Winter is coming! And as the days get shorter and the nights get colder, our feathered friends in the garden could do with a bit of a helping hand to stay warm. It is so easy to feed the birds, and doing so will help them to overcome periods of natural food shortage and survive any severe winter weather so they are in tip top condition ready to breed in the spring. Feeding wild birds makes it really easy to watch a whole range of fascinating species up close, and it is a great way to get kids interested in wildlife too. Positioning bird feeding stations in view of windows means you can study their beautiful colours and quirky behaviour up close, and also keep any eye on when the feeders need to be topped up. A simple bird table is suitable for most foods and will attract lots of different species. You can easily make one - it just needs a raised rim to retain the food and a gap at each corner of the rim so that water can drain away and you can easily clean away any droppings or uneaten food. A good variety of different feeders and food types will encourage a wide variety of different birds to your garden- try feeding a range of different bird seed mixtures, black sunflower seeds, nyjer seeds, peanuts, bird cakes, fat balls and mealworms, all of which you can buy from local garden centres or hardware stores. Peanuts and fat balls are often sold in nylon mesh bags, never put out any food in these as they can trap birds’ feet or beaks, and don't put out whole peanuts in the spring as they may choke young birds- crush them first or use a special peanut feeder. 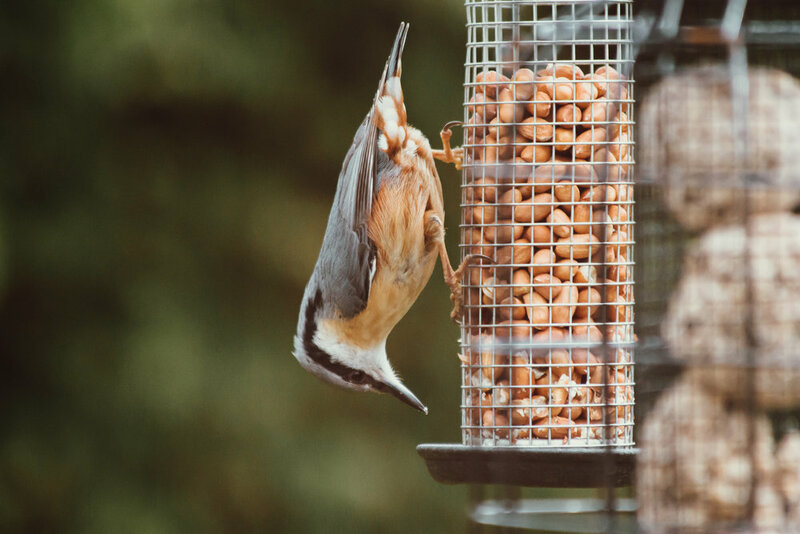 There are lots of hanging bird feeders available which you can position around your garden, such as steel mesh nut feeders, fat ball hangers and seed feeders. Just make sure you choose the right type of feeder for the food you are using. Make sure you position bird feeders and bird boxes out of reach of cats and dogs. Never feed any mouldy food and clear away any uneaten food from your feeding stations. Some species of birds, such as blackbirds, prefer to feed on the ground, so try scattering some food on the lawn or use a ground feeding tray. Space the food out to reduce competition between different birds and keep any ground food out in the open so that the birds won’t fall prey to any lurking cats. Don’t be tempted to put out more food than can be eaten in a day to avoid attracting vermin. Wild birds will appreciate being fed all year round, but it is the winter months where it is particularly important- especially when the ground is frozen. Ask a friend or neighbour if they can top up your feeders if you’re going to be away, as the birds will come to rely on you for their dinner. It’s really important to provide a source of water too, either a wildlife pond or bird bath is great. Floating a tennis ball in the water when it gets colder should help to stop it from freezing. 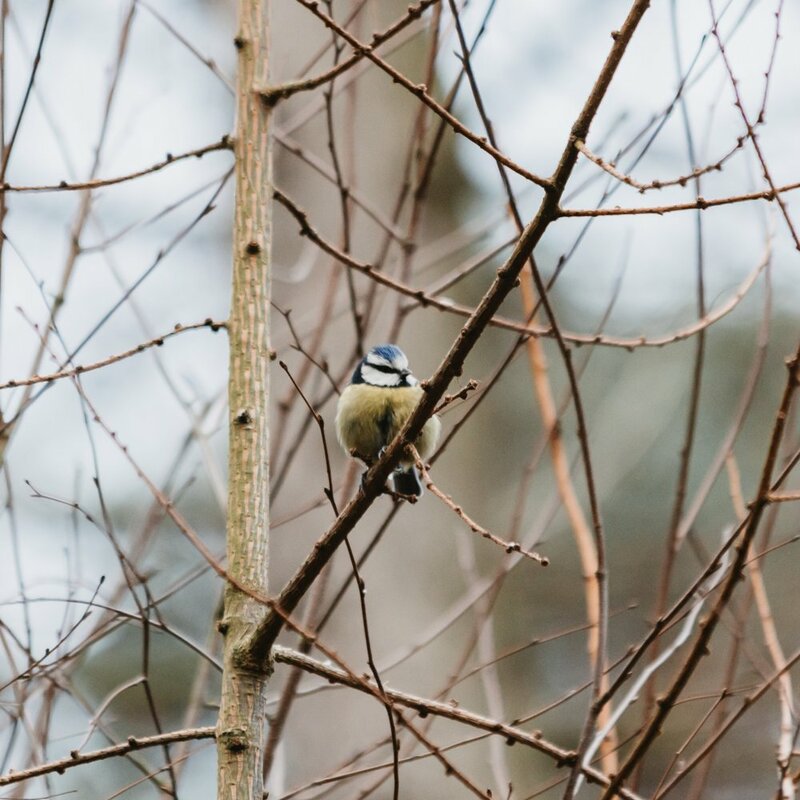 If you have the space you could even turn your whole garden into a bird foraging paradise, by planting a wide variety of fruiting trees and bushes. More on that in a future post….